Coaches, interested in bringing a BEA workshop to you? Basketball Education in Action has worked with practices and camps to deliver these messages and skills to as many girls as possible. Check out our past workshops for ideas and send a message to changb.10@gmail.com. Open to all: This workshop teaches high-level, team-first thinking for players that not only want to take their games to the next level, but want to help their teams reach goals beyond their talent. Players will think critically about real-life game situations, rip apart their tendencies to play “the blame game”, and learn to take responsibility for their roles. The workshop will broaden their vision on the court, encourage them to pay attention to things beyond themselves, ad each athlete will walk away with BEA’s not-so-secret Keys to Awesomeness. Team workshop (two parts): In addition to the workshop described above with specific team situations (part I), this workshop will lead your team through a goal-setting exercise to discover a player-defined keys to success for the entire squad. The girls will then look at how each individual player fits into the overall goals, and how to pay attention to and adjust to the strengths and weaknesses of her teammates. The aim of the workshop is to make the players think critically about their teammates, and how to purposely build chemistry on the court, make adjustments, and communicate. For high school level teams only. As the WNBA celebrates its 20th year, BEA mentors and trainers take the girls back to the beginning of it all: how we could finally imagine ourselves playing on television in ponytails, how every other girl at tournaments wore the Sheryl Swoopes shoes, how we went from social outcasts to the top of the totem pole almost overnight, and how AAU basketball as we know it today really took off. Not only will the girls learn about the WNBA through a trivia, but they will think and debate critically about its future. The Symposium invites the girls to imagine a life without the WNBA, open their eyes to the obstacles that continue to face women’s sports, and to encourage their contribution as either participants or pioneers of our sports movement! 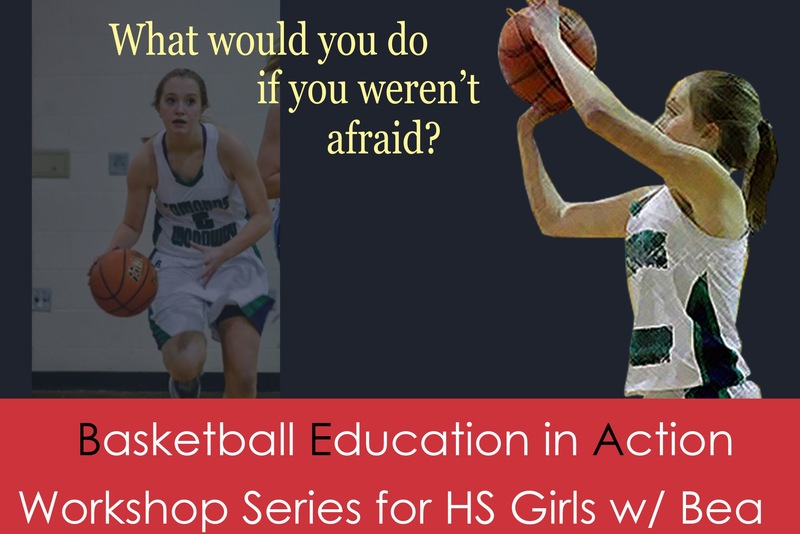 As competitive high school basketball becomes a year-round commitment–in addition to everything else teenage girls want to do–this session works with young athletes on how to use their limited time to push their games to the next level. Girls will walk out of the workshop with timely goals and plans of action, methods to play to their strengths to improve their weaknesses, and formulas for growth as basketball players. Of 12 All-County/All-State high school seniors I graduated with, only two of us made it through four years of college basketball. The biggest problem, according to a coach at Seattle University, is the girls’ false expectations of what the college experience is, and how drastically it differs from “what their dads went through.” We are here to tell high school girls today what it’s really like to play basketball at the next level, and the many options available to them now. This session is put together with the help of over 20 former women basketball DI, DII, and DIII players–complete with a picture of the full collegiate athletic experience as well as the in’s and out’s of the recruiting and the decision-making process. We ask our girls to be leaders on the court, but what does that really mean? In this workshop, girls will learn about different types of leadership, think critically about what “good” leaders say and do, and develop awareness of herself and her teammates. We will discuss key communications skills on and off the court: how to say the right words, at the right time, with the right tone and body language. Each athlete will walk away with an analysis of her own leadership strengths, as well as a plan of action to make the choice to become a leader and make a positive impact on her team! The football quarterback is the hottest, most popular guy in school; what about the girl point guard? Hollywood still shows girl jocks as outcast, but we all know that is no longer true. So what, exactly, are we? This workshop will take girls and parents on a quick journey through Title IX to the WNBA to the #throwlikeagirl movement and the current gender battles in college athletics–and why it has to do with who we are and why it matters to all of us. Girls will learn to think critically about their identities. They will learn to recognize gender issues, to question stereotypes, and, ultimately, to strive to break glass ceilings. We see our girl athletes today not only as products of women’s sports progress, but as important participants and pioneers in our future. The success of the first “Girl Jocks” workshop in 2015 inspired the Awesome Sports Project, an online platform dedicated to the voices of girls and women in sports. Check it out!